In February, I shared two posts on the subject of conservation. The first post introduced readers of the Home Archivist to institutions and individuals working to preserve Canada’s documentary heritage, and described the safety equipment and tools that paper conservators use to process historical records. The second post saw those tools being put to use in the preservation of paper documents like those in the MacKendrick collection that are affected by dust, mold, soot, adhesives, and other accretions. Now that (most of) the MacKendrick letters have been opened and the contents cleaned and flattened, we can turn our attention to thinking about how archival documents are readied for public consultation. In particular, we’ll explore why documents are catalogued the way that they are. 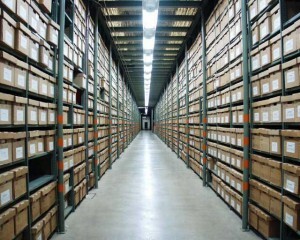 Records Centre Picture, Texas State Library and Archives Commission. Available through Creative Commons License. Readers that have conducted archival research will know that there are significant differences in the classification systems of libraries and archives. 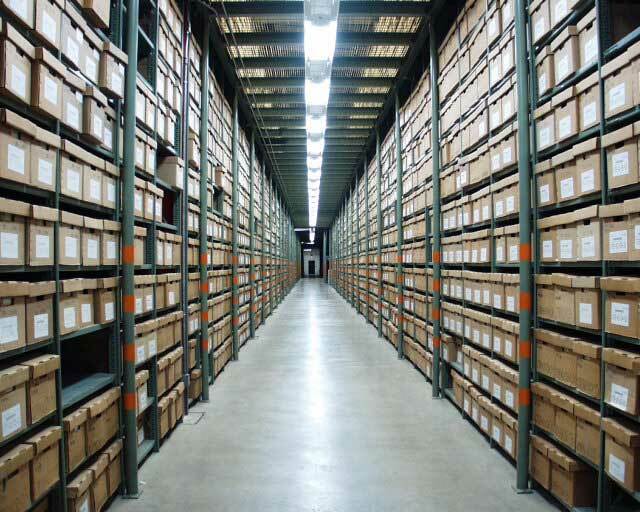 Whereas the former typically orders books based on subject or author in the case of fiction, archives organize their collections by fonds, groups of documents that originate from the same source. Archival organization is largely informed by two related ideas: respect des fonds (or provenance) and the principle of original order. Respect des fonds stems from the belief that a collection can tell us something about an individual or institution and their sociohistorical context. A collection’s provenance refers to who created or assembled the records, why, and under what circumstances. Michael J. Fox (not that one) and Peter L. Wilkerson note that the creator of a collection and the creator of its constituent documents may not be one and the same. In the case of the MacKendrick letters, it is often quite easy to identify the letter writer. Most of the letters are signed and/or accompanied by an envelope. Who was responsible for keeping the letters and arranging them in bundles is less clear. Was it Jack? Amelia? Both of them? Someone else all together? This is a question which could (and will!) be put to the family. The why is equally difficult to ascertain. Were the letters retained for personal reasons? Were they meant to be passed along to children and grandchildren? Given the care with which the letters were collected and bundled, I assume it was not a historical accident. Lastly, we must ask about the external factors that shaped the collection’s creation. Here the personal motivations of the letter writers and keepers are linked to the larger historical landscape. Consider, for example, the letters the MacKendricks exchanged when they were courting in 1890 and 1891. If those letters were divided into Amelia’s letters and Jack’s letters and held in separate fonds or, worst case scenario, sent to two separate institutions, it would be more likely that a researcher would only get half the story. Certainly historians can do their best to decode such letters, but it never stands in for having the other half of correspondence. The second organizing principle, original order, centres on the idea that it is not just the contents of the collection that shed light on the creator(s) and the circumstances of production, but also the organization and arrangement of the records. Thus, it is important to not only maintain original order, but also to pay close attention to the creator’s organizational system. How did the creator group records? Was there a greater attention to detail in some sections rather than others? At first, I thought the MacKendrick documents were organized chronologically and to some extent they were. The bundles of letters were each assigned a year and most of the letters in a given bundle were from that year. However, each bundle contained outliers, some more than others. A closer read of the letters in an individual bundle may explain why it contains missives from 1891, as well as 1888, 1892, and 1893. It may also lead to new research discoveries. More generally, reflecting on original order sheds light on how the creator understood the meaning of individual documents, as well as connections between the various documents. Of course, as Fox and Wilkerson note, “not all materials come into archival custody in a discernable, let alone pristine, order.” What is to be done in this case? Ideally, the archivist can reconstruct the original order “by looking for relationships among individual items and for connections among groups of items.” If this isn’t possible, then the archivist must develop their own system of organization. It is common archival practice to arrange letters by recipient. In other words, all of the letters addressed to Amelia would be placed in one folder. If there were many letters for Amelia, they could be further arranged chronologically. For example, all of the letters written to her in 1890 would be placed in folder A, all of the letters from 1891 in folder B, and so on. Alternatively, letters to Amelia could be designated Series A and then files within that series would hold letters from different correspondents. Organizing letters by recipient and date requires more limited investment on the part of the archivist. Typically the key information, namely the correspondents and the date, is immediately apparent. Thematic arrangements, by contrast, demand time and attention be paid to the contents of individual letters. For example, I could place all of the letters exchanged during Jack and Amelia’s courtship in one file or all of the letters from Jack’s students (you may recall that he taught school in the early 1880s) in another. In this case, I would need to read enough of the letters to be able to identify relevant themes and to group the letters accordingly. Is this a feasible strategy for a collection that contains hundreds of letters? A combination of these approaches is also an option. The important thing is to make clear the organizational strategy, whether it was the original order of the collection or something created by the archivist, in the finding aid, a navigational tool for archives that I will discuss more in a moment. I had the opportunity to speak informally to a group of archivists that work at Library and Archives Canada in November when I visited the Preservation Centre. I appreciated being able to ask questions about things that had been niggling at me as I processed the letters, but particularly as I tried to make sense of the MacKendrick collection’s organization. It is difficult for me to not think about the documents as a historian. I want to know every little detail. I want to go down every rabbit hole. After only a few days it became clear that I would never process the letters at this rate. There is a potentially symbiotic relationship between historians and archivists. Archivists catalogue and make accessible historical documents, which historians then interpret, producing materials that enable archivists to better understand their collections. As much as we are all in this together, though, we have different objectives and interests. As one archivist I spoke to noted, the thematic stories in the MacKendrick collection that may interest me as a historian of sport and leisure, such as discussions of canoeing or cottaging, may not be the stories that interest others in the consulting public, genealogists for example or a business historian. The archivist needs to anticipate the breadth of interest that a collection could excite and then create finding aids to enable a wide swathe of people to access what they need. I’ve now mentioned finding aids twice. For those who are unfamiliar with the term, it is a document that assists researchers in navigating archival collections. Finding aids, which are also known as guides, inventories, and registers, include information about the provenance of a collection and the institutions and individuals represented therein, as well as more technical details such as the physical extent of the collection (i.e. number of items, linear distance), the types of media, and access restrictions. Finding aids may also include a detailed overview of the contents including references to box and file numbers. This article may be of interest to those curious about the history of the finding aid as an archival tool and a genre in archival practice. What activities, events, and functions are documented? Who is involved, and what is his or her relationship to the activity, event, or function? What is the setting and location? What are the products, outcome, or consequences of the activities documented in the collection? Not everything produced through these queries will be included in the description. Nevertheless, these questions should generate the most important details. I had hoped to have the time to create at least a rudimentary finding aid for the MacKendrick letters, both as an example for readers of the Home Archivist, but also as an exercise for myself. I’m still not sure that I appreciate the amount of work and restraint that goes into the creation of a finding aid. Unfortunately, other commitments prevented me from doing so. In lieu of a finding aid for the MacKendrick collection, I will provide you with a couple of samples. Finding aids come in a wide range of styles. I have chosen one that recalls an older age of finding aids when they were more likely to be paper documents found in a binder on site and a newer digital finding aid. Time, always in short supply, has been a central theme of this project for me. How much time does it take a conservator to process a collection? How much time does it take an archivist to review and organize a collection? How much time (ie. research) is needed to produce a suitable finding aid? How much time does it take for the historian to read the contents of a collection, in this case hundreds of letters? How much time (ie. research) is necessary to make sense of those letters and the stories therein? Time is running out on the Home Archivist series. In my final post, I’ll return to being a historian. I look forward to telling some stories drawn from the MacKendrick letters. Jessica Dunkin recently relocated from Ottawa to Yellowknife to work as the On the Land Programs Consultant for the Northwest Territories Recreation and Parks Association (NWTRPA). She is still a historian at heart. You can follow her on Twitter at @dunkin_jess.